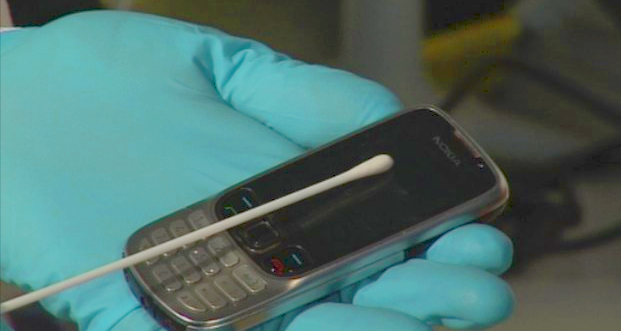 It’s a well-known fact that cell phones are dirty objects, but just how dirty are they? Cell phone statistics show that each square inch contains roughly 25,000 germs, making it one of the filthiest things you come in contact with on a daily basis. That’s something to think about the next time you press your face to your phone. So what objects are actually cleaner than your phone? Surprisingly, toilet seats make the list because they’re usually sanitized often. Watch this cool video to see how an average cell phone’s bacterial count stacks up compared to other household items, as reported by Mashable. Many people think that just because they are the ones touching their phones and that they don’t come in contact with outside germs. Our phones are pretty much attached to our hands, we take them to the bathroom, the gym and use them while eating dinner. This allows cellphones to collect germs at a rapid rate. A study conducted by Veloxity of 200 Americans in the Boston area further supports this point. Out of 200 cell phone users, only 16 admitted to cleaning their phones on a daily basis. 45 of the 200 samples claim to clean weekly. Germs and bacteria are notorious for thriving in warm places. Not only does your smartphone generate its own heat, but it also gets help from your own body heat by spending time in your hands. Since most smartphone users rarely clean their devices, it’s no wonder that smartphones are prime breeding grounds for bacteria. Time to come clean folks. To clean your mobile device, dampen a soft cloth with water or rubbing alcohol and wipe it down. Better yet, use a disposable wipe made specifically for cleaning electronic screens. Use a cotton swab to get the grime and dirt out of small nooks in the phone. Feel cleaner already? At Veloxity, we really do care about keeping customers healthy and fully charged.